CAMALIG (Philippines) (REUTERS, AFP) – The Philippines ordered the forced evacuation of people from two more municipalities near a restive volcano on Monday (Jan 15) as the chief volcanologist warned of a possible hazardous eruption “within weeks or even within days”. More than 12,000 residents have already fled to evacuation centres after the 2,462-metre Mayon volcano, in central Albay province, began spewing ash on Saturday and unleashed burning mud and rocks on Sunday. “There is an ongoing forced evacuation from the municipalities of Daraga and Legazpi because of the lava flow,” Romina Marasigan, spokeswoman for the National Disaster Risk Reduction and Management Council, told reporters. Mayon, a tourist attraction because of its near-perfect cone shape, showed a bright crater glow on Sunday, signifying lava had started to flow from the crater. Manila’s airport authorities said Cebu Pacific had cancelled flights to nearby Legazpi City for a second day on Monday, citing bad weather. Philippine Airlines said it had not cancelled any flights to and from Legazpi, but there were some delays. The Philippines raised the volcano alert to level 3, which indicates increased volcanic activity toward a hazardous eruption, late on Sunday. Level 5 indicates an eruption is in progress. People have been advised to stay away from a 6km radius Permanent Danger Zone and a 7-km Expanded Danger Zone on the volcano’s southern flank. Experts at the Philippine Institute of Volcanology and Seismology (Phivolcs) advised residents to use a damp cloth over their mouths and stay indoors to avoid inhaling sulphur dioxide gas. “If you breathe, you will feel like coughing and clearing your throat. It also stings and is painful in the eyes,” Bert Recamunda, a 55-year-old engineer and Mayon watcher, told AFP after visiting Camalig town near the volcano. Classes were suspended in parts of Albay province where Mayon is at, and some schools were used as evacuation centres. “I am afraid. The volcano rumbles like a rolling thunder,” said Nerry Briones, 40, from a classroom in Camalig town, where she and her three children have stayed for the past two nights along with other evacuees. Mayon, a near-perfect cone that draws thousands of tourists, even during minor eruptions, rises 2,460m above a largely agricultural region some 330km south-west of Manila. It is considered the nation’s most active volcano. An explosion in August 2006 did not directly kill anyone, but four months later a typhoon unleashed an avalanche of volcanic mud from Mayon's slopes that claimed 1,000 lives. 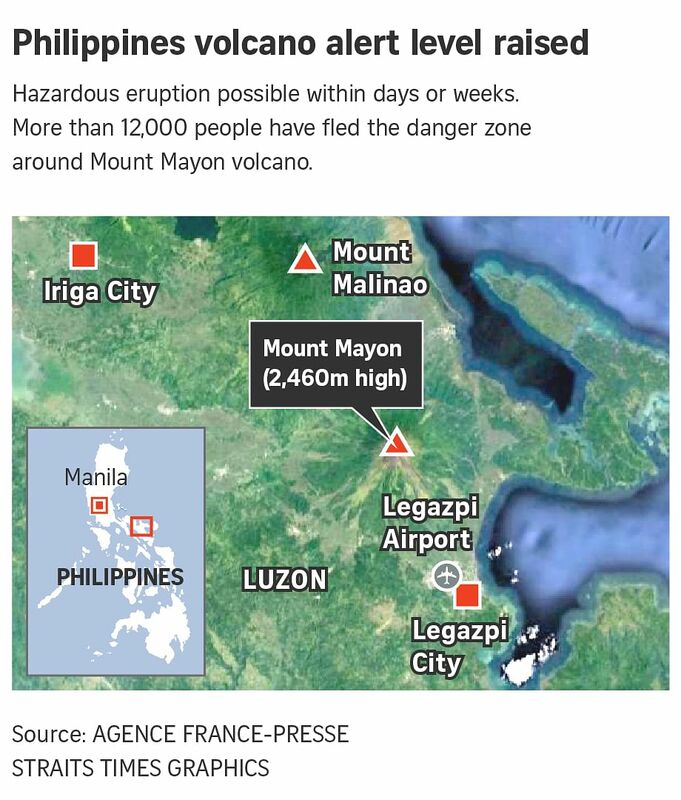 In May 2013, four foreign tourists and their local tour guide were killed when Mayon erupted.